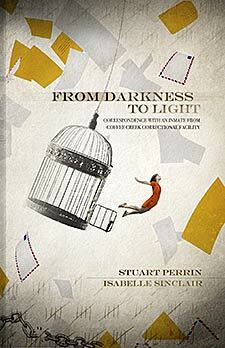 From Darkness to Light is a heartfelt and poignant exchange of letters between Isabelle Sinclair, a twenty-one year old inmate at Coffee Creek Correctional Facility, and Stuart Perrin, who teaches Kundalini meditation practice there. When I first met Isabelle Sinclair at a Coffee Creek Correctional Facility meditation class, she was a waif of a thing with blue hair and dark penetrating eyes that revealed a deep intelligence and hunger for a spiritual life. She looked at me with an appraising eye that belied a lack of security and covered a sincere need for life out of the ordinary. One rarely sees that in a twenty-one year old person. I knew nothing about her past nor did I care, but she reminded me, a bit, of what I was like when I was her age. When I received Isabelle’s first letter, it was analytical, a little bit angry, and distrustful, but beneath the surface there was a deep need for some kind of spiritual guidance. One letter followed another, sometimes two or three at a time, but each letter, whether full of anger, insecurity or gratitude, revealed a hunger in this young person for a life that transcended the ordinary. She wouldn’t accept the mediocre and commonplace she saw in people and refused to lead a boring and mundane life. It so much reminded me of myself when I was her age, her incarceration was simply rebellion against the ordinary. I told her, both in our letters, and when I taught at Coffee Creek Prison that there are no accidents. She had to be grateful for time spent at Coffee Creek because it would completely transform her. If she developed a strong inner life, she could use the deadly atmosphere of prison as a reminder that she had no choice but to continue to fix her own mental and emotional chaos…and I could help her do it.